An experimental nuclear physicist has written an Open Letter to world renowned physicist, Dr Michio Kaku, challenging his dismissal of non-conventional energy devices - more popularly known as “free energy” machines. In a Coast to Coast AM radio interview on April 18, 2009, Dr Kako dismissed free energy machines as impossible due to their violation of energy conservation laws. Dr Robert Koontz, a nuclear physicist who has worked in various government projects and held Top Secret classification, pointed out the fallacies in Dr Kaku’s thinking. Dr Kaku, according to Dr Koontz, needs to reconsider the feasibility of non-conventional energy devices. Otherwise he may suffer the same fate as early scientific critics of the Wright Brothers - critics dismissed the idea of heavier-than-air flying machines as impossible. Recently, on the popular late-night radio program, "Coast to Coast AM," which reportedly has a listening audience of millions, you indicated that investors call you up daily and ask whether certain inventions will work. Characterizing those devices as "perpetual motion machines" you said they were impossible to make. Dr Kaku’s dismissal is based on energy conservation laws that are based on the scientific belief that energy can only ever be converted from one state to another. This leads to the view that the amount of energy in the universe remains constant, and no energy is ever lost or created. The idea that a machine can be created which generates more energy than it consumes to run forever has been deemed to be scientifically impossible. The idea of perpetual motion machines has long been discredited and has been used as a kind of scientific slight against those proposing non-conventional energy devices. Dr. Kaku: You appear to believe that the universe has 11 dimensions, many of which are supposed to be hidden. Why would that be true while creation of energy using negative mass electrons or using gauge transformations would be impossible? Could you be wrong, sir? Undoubtedly you think you are not wrong, but could you be wrong, sir? You might say to me that negative mass electrons have never been seen. But those many dimensions you believe in have never been seen either. And is it not true that we physicists for decades have used negative mass electrons in our theories in order to reach agreement with experiment? Dr Koontz’s reference to negative mass electrons is one way in which he believes energy conservation laws can be maintained in an unconventional energy device. He goes on to cite the work of Nobel Prize winning physicists, Dr Paul Dirac, who was the first to introduce negative mass electrons. When Paul Dirac, the Nobel prize-winning physicist was developing the first form of relativistic quantum mechanics he found it necessary to introduce the concept of negative mass electrons. This subsequently led Dirac to develop the idea that a hole in a sea of negative mass electrons corresponded to a positron, otherwise known as an antielectron. Some years later the positron was observed and Dirac won the Nobel prize. Another way for an unconventional or “free energy” device to work is for it to use rotating electromagnetic fields using magnets, plasma, or other electrical conductors. This creates what is called a “torsion field” where energy is generated from the rotating objects. According to Dr Elizabeth Rauscher and Nassim Haramein from the Resonance Project, torsion fields power all known rotating objects in the universe from suns and galaxies, to atoms. Other physicists point to a zero point energy field where a quantum flux creates virtually unlimited energy. Essentially, free or "zero point" energy comes out of the vacuum of space in a manner similar to a bottle of soda that is shaken and opened. This was first theorized by the Dutch physicist Dr Hendrik Casimir in 1948 and later experimentally confirmed. The Casimir Effect is now used in nanotechnology to power microcircuits. If an unconventional energy device uses negative mass electrons, as Dr Koontz claims, then the energy conservation laws of physics may well be maintained. If “free energy” devices use rotating magnetic fields or zero point energy, there appears to be no way energy conservation laws can be maintained unless one considers energy moving between dimensions. 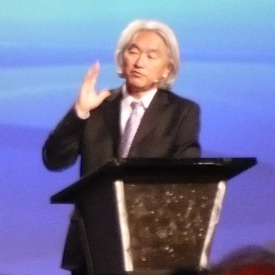 Interestingly, Dr Kaku believes that 11 dimensions exist - some of which are obviously beyond human perception. If so, there are a number of ways in which the energy conservation laws of physics can be maintained across the “omniverse’ of 11 dimensions while considering the feasibility of unconventional energy devices. Perhaps we’ll find some answers if and when Dr Kaku responds to Dr Koontz’s challenge. "You Could Be Sued for Millions and Ridiculed for Centuries"
This open letter relates to your disparagement of energy-producing devices which at this juncture in time are demonstrably critical to our nation's survival. And I write this letter as a Ph.D. experimental nuclear physicist with qualifications that I believe allow me to speak to the subject in question, namely production of energy using non-conventional means. I ask that you read this letter carefully and ask that you not dismiss it out of hand in the manner of many of our country's physicists. Recently, on the popular late-night radio program, "Coast to Coast AM," which reportedly has a listening audience of millions, you indicated that investors call you up daily and ask whether certain inventions will work. Characterizing those devices as "perpetual motion machines" you said they were impossible to make. But that can be proven to be a false statement. Such devices can exist if negative mass electrons can be introduced into electronic circuits and possibly certain machines. They can also exist if other forms of negative energy can be created, and apparently they can. Finally, it appears to be the case that gauge transformations could allow such devices to work. This would not involve a violation of one of the most important laws of physics, namely energy conservation, either, Dr. Kaku. I believe you assume that such devices do violate the laws of physics, which is also an assumption that appears to be made by others. You might say to me that negative mass electrons have never been seen. But those many dimensions you believe in have never been seen either. And is it not true that we physicists for decades have used negative mass electrons in our theories in order to reach agreement with experiment? And wasn't the positron discovered because Dirac invoked the existence of negative mass electrons - approximately 80 years ago? Perhaps it is true that we physicists have not yet observed negative mass electrons, but does that mean they do not exist? Now let me ask you this: Have you ever examined even one of the devices that you tell investors cannot work? I suspect you haven't. There are in fact inventions that produce energy without having any kind of conventional fuel. You may see one work in a web page of mine linked to below. But perhaps you think you don't even need to look. Could that be the case, Dr. Kaku? Perhaps you simply "know" these devices can't work. Might you not also have said many years ago that airplanes could never fly? Before the Wright brothers were flying airplanes, renowned scientists said it was impossible. So, I ask that you examine the video linked to below and I ask that you examine other such videos. Here is the link to another web page of mine that has links to more such TPU (Toroidal Power Unit) videos. I can assure you the TPU device works, sir. For the sake of our nation and the world, I ask that you take the small amount of time needed to examine these videos. Please don't say that the above demonstrations were faked, Dr. Kaku. There are many engineers who examined the device. And some demonstrations were made outdoors, far from any possible sources of energy. The TPU units shown in the videos apparently use gauge transformations. Those would be the same kind of gauge transformations that, for decades, you theorists have been telling us allow for electromagnetic energy non-conservation, but then say don't have any practical applications. And we know that theoretical physicists are never wrong, don't we? So the device cannot work, can it? So why then does it work? Could it be that gauge transformations do have practical applications? Could it thus be that theoretical physicists could be wrong about the impracticality of using gauge transformations to make energy? I think so. Do not gauge transformations lead to electromagnetic energy non-conservation? And is it not true that in your analysis of free energy devices you assume that electromagnetic energy is conserved? That is a grave inconsistency, sir. And arguing that gauge transformations lead to no change in the electric and magnetic fields is not at all convincing as the question relates to energy, not electric and magnetic fields. Would you say that gauge waves cannot exist? And if you do allow that they can exist, would they not carry energy, possibly in both positive and negative forms? Where then am I wrong, Dr. Kaku? Or could I be right - along with many other Ph.D. physicists and engineers who are regularly dismissed as crackpots? You have said that you greatly respect the work of Nikola Tesla, and surely you have studied his inventions and his life. If so, then you might be aware that Nikola Tesla was planning to transmit power all over the world in a way that you would surely say is impossible. But you must know that Nikola Tesla was a very careful experimenter who tested every idea before employing it. What then is the answer to the implied dilemma? So, Nikola Tesla was just a wild man, right? A nut. While Michio Kaku and his 11 dimensions make wonderful sense. Or could you and others be wrong about what Nikola Tesla was doing? Could it even be the case that Tesla was using electromagnetic theory that included the very gauge transformations that physicists of this era do not include? Is that not possible, sir, and if not, why not? Therefore, if I may speak freely, I would say that while millions or even billions of people live in desperate poverty, and while millions of Americans lose their jobs because we don't have this kind of technology - you tell people that such technology is impossible, when it isn't. Is everyone who disagrees with you and other leading theorists a crackpot, Dr. Kaku? Was Nikola Tesla a crackpot? I would strongly suggest that he wasn't at all a crackpot but was one of the greatest inventors in the history of the world - and I believe you have also said as much. So why then would you dismiss Tesla's ideas about free energy? I must say that I have seen many smirks in association with production of free energy - Smirks - while millions of Americans lose their jobs and the United States falls into a terrible economic decline. Smirks. Is that appropriate, sir? I would say not. But the matter does not end with the above TPU units. There is also the work of Thomas Henry Moray who was able to produce an estimated 50 kilowatts of power from a tabletop unit that my analysis indicates involved employment of negative mass electrons which Dr. Moray apparently captured in very special circuits he built - many, many decades ago. Here is a link to what I have written about Dr. Moray's work. There are many more links on the Internet: Please do take the time to investigate. A world desperate for energy waits.